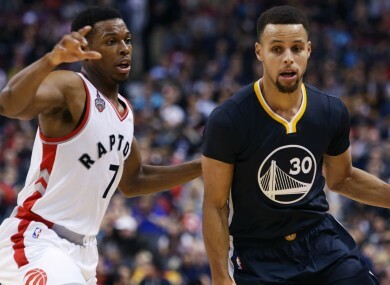 REIGNING NBA CHAMPIONS Golden State Warriors continued their flawless start to the season after extending their unbeaten run to 21 games with a 112-109 win over the Toronto Raptors on Saturday. Reigning MVP Steph Curry led the way with 44 points — his seventh 40+ point game already this season — as the Warriors stayed perfect on the road in Toronto. Curry was 14 of 24 from the field, while he made nine three-pointers. Curry was supported by Warriors team-mates Klay Thompson (26 points) and Draymond Green (16 points, nine rebounds). Kyle Lowry had 41 points, but it was not enough for the Raptors. Elsewhere, the Miami Heat claimed a 99-84 win over the Cleveland Cavaliers, who were without LeBron James. James was rested for the trip to Miami — the earliest the four-time MVP has missed a game due to rest — and the Heat took full advantage as the Cavs suffered a third consecutive defeat. James’ former team-mate Dwyane Wade and Tyler Johnson scored 19 points apiece, while Goran Dragic added 17 of his own. Richard Jefferson, who started in place of James, led the Cavs with 16 points as Kevin Love was restricted to just five points and eight rebounds. The Houston Rockets extended their winning streak to three games via a 120-113 victory against the Sacramento Kings. James Harden (31) and Dwight Howard (22, 18 rebounds) inspired the Rockets, the pair combining for 53 points in Houston. The Kings had seven players with double-digit points, namely Ben McLemore (19) and Darren Collison (18). Elsewhere, the San Antonio Spurs maintained their unbeaten record at home after edging the Boston Celtics 108-105. Nicolas Batum’s 24 points helped the Charlotte Hornets past the Chicago Bulls 102-96, while the lowly Philadelphia 76ers were beaten 108-105 by the Denver Nuggets. The Portland Trail Blazers trumped the Minnesota Timberwolves 109-103, the New York Knicks lost 106-91 to the Milwaukee Bucks, the Los Angeles Clippers upstaged the Orlando Magic 103-101 and the Indiana Pacers lost 122-119 to the Utah Jazz in overtime despite a career-high 48 points from Paul George. Email “Curry stays hot as Warriors take their undefeated streak to 21”. Feedback on “Curry stays hot as Warriors take their undefeated streak to 21”.